At times, the haunting entity we call “nostalgia” comes around and sweeps the area in a wind of contemplation, bringing back some (good) memories. It happens with food, with video games and yes, it can even happen with music. You know, like how some people keep some silly records in their collection even though they would never admit to it, only for the sake of listening to it when they’re alone. “Guilty pleasures”, I suppose you could say. But at times, you listen to an album and it reminds you of a time when you heard a band you like for the first time and how enriching and enlightening that musical experience was. The band I present to you today is the Finns of Epicrenel. Being praised by the label as a revelation and clamouring their debut album The Crystal Throne as “the most impressive symphonic metal album of 2013”. Despite the widely known fact that labels tend to make the icing on the cake quite thick (that’s an understatement), I got a bit of a surprise with this band and their debut album on the small Finnish label that is Inverse Records. I have to admit, when I first read the overbearing and ridiculously cheesy description for the album, I groaned and thought I was in for one of those annoying, cheaply produced fantasy power metal records with a shrieky/wailing vocalist with a stupidly high tone that sounds like his family jewels are being squeezed. All kidding aside, after the mandatory intro (“The Calling”) and into the opening minute of “To Cursed Lands Again”, I immediately could relate to the time when I listened to one of my favourite Swedish power metal bands:Dragonland. Everything from the production to the riffing to the general feeling of the music reminded me of the first time I heard Dragonland’s Holy War. For the uninitiated, what you get is some power metal with a lot of speed, some neo-classically inspired riffing and some soaring vocals. There’s also a strangely “chunky” sound to the guitars which sometimes gives a more heavy metal vibe than power metal, in the sense that it makes the overall vibe more dramatic rather than light-hearted like a lot of fantasy-themed power metal. Speaking of vocals, the vocalist here might sound quite familiar to power metal fans since it’s none other than Christian Palin (ex-Adagio, Random Eyes). His voice is sometimes slightly accented but there is certainly some power and melody in that set of pipes, considering his performance on Adagio’s Archangels in Black. Let’s get the main thing that disappointed me with The Crystal Throne out of the way right now: when I see an album classified as “symphonic metal”, I expect it to be just that (symphonic). While there is certainly some good keyboard work throughout the album, I don’t quite get the sense of grandeur and majesty that I’d like (or expect) with fantasy-themed power metal deemed as being “symphonic”. However, that doesn’t mean I didn’t like the album. Actually, it’s not bad at all and there’s definitely some talent in this young band. I’ll talk about the rest in detail as I go along doing a quick run-up of the songs. The aforementioned intro “The Calling” is short but serves its purpose. It definitely sounds like keyboard orchestration but is well done nonetheless. “To Cursed Lands Again” is the first real track and we get thrown into a solid power metal number, with a ridiculously catchy chorus and a good solo. I get reminded of Dark Moor a bit. Actually, after listening to it so many times, I do find that The Crystal Throne sounds close to them at times, especially on Dark Moor’s self-titled or Beyond the Sea. “Where Kingdoms Fall” is one of my favourite songs here, featuring some nice cruising speed (complete with double bass) into the chorus and it is quite a stupidly catchy chorus once again. The next song titled “Wall of the Cave” starts with an odd vibe that takes the album to a much darker place, with some pretty cool keyboard playing featured here. The next two songs, “Floating Souls” and “Guardian Fellhound”, are decent but not quite as catchy as the previous ones. However, the first has a good solo section and the latter has a good vocal performance. After that we get “In the Dungeon”, an obviously darker song with low-key vocals that is different and pretty cool, with some great instrumental fireworks by the band members. Speaking of instrumental fireworks, “Skyride” is a fully instrumental track and it’s quite a good one. One certainly wouldn’t be able to fault the band/album for not featuring competent musicians. “Defenders of the Crown” is the first real offense”. It tries a bit too hard to be dramatic and it ends up being a bit too noisy and Palin oversings a bit, despite the song having a decent chorus. It’s not terrible but it’s far from my favourite here. This dramatic turn of events continues with “The Fantoms’ Grove” which is better to my ears. It has a pretty cool chorus but the verses are a bit oversung again to me. I don’t know if it’s just me, but it seemed that the more dramatic songs had Palin struggling a bit. His voice didn’t quite fit and sounded forced to me. As much as he can soar and sound great, his darker, low-key register needs work. And then, we get “Conquering the Throne” which closes the album with a more heavy metal-like number with some pseudo-symphonic melodrama. It’s a decent song, but not quite the powerful symphonic finale I’d have wanted, especially when I compare it to things like what Dragonland did with the “Book of Shadows” trilogy on their album Starfall. The album comes to a real closure with a short outro called “The Coronation” which is alright, but a bit on the cheesy side with its obvious triumphant vibe. It’s well done, though. Overall, I would say my general feeling is that the album starts out very strong and stays strong up until after “Skyride” which from there it starts getting a bit tired and the last few songs aren’t on par with the first ones, sadly. It’s a shame because the material that is good is most definitely enjoyable but the final few songs really drag for me and the final score of the album will reflect that. 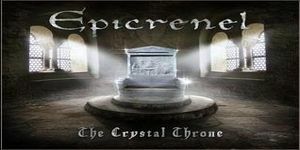 Nevertheless, if you’re a power metal fan, definitely do check out this Finnish band, since Epicrenel has some good talent on display on The Crystal Throne. Don’t expect a new Rhapsody orStratovarius, but you could definitely do worse for this genre (I’ll refrain from dropping names) and the future might have some good things in store for the band if they keep working and manage to keep the quality of the songwriting to the level of the first few songs on this album. While known for his work with Firewind, Dream Evil, Nightrage and Mystic Prophecy, the wider American audience will probably recognize Gus G for his performance on Ozzy Ozbourne’s 2010 album “Scream.” To me the guitar sounded like second hand Zakk Wylde and it left me unimpressed. But try not to think of that album — Gus’ second solo L.P. is a pretty decent blast of melodic metal.